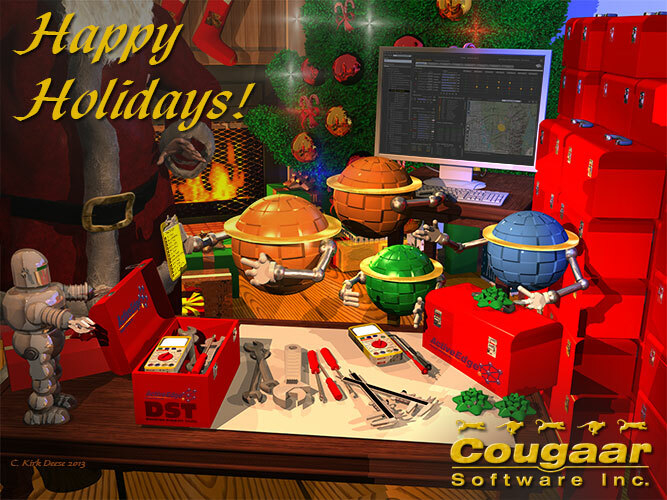 Every year Cougaar Software, Inc. (CSI) designs a holiday card wishing you and your family our sincere wishes of peace, health, and happiness during the holiday season and throughout the coming year! CSI is very proud of the cards and their innovative designs and would like to share them, so they can be enjoyed year around. Designing annual Christmas cards began in 2007 with the novel idea of creating an illustrated company Christmas card. I tried to think of how to create something unique to the company and still have a holiday feel to it. At that time, CSI was still a very new company and in the process of building ActiveEdge®, our intelligent agent software. I had created these round, robot-like characters to represent our software “intelligent agents” for proposal packages and slide decks. 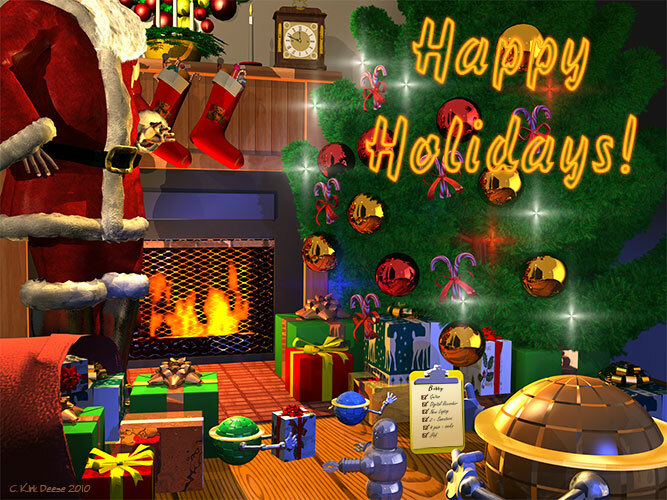 Because CSI was in a building phase, I thought the agents could also build a Christmas scene. I wanted to incorporate a little humor in it as well, so I had the agents build a basic snowman. 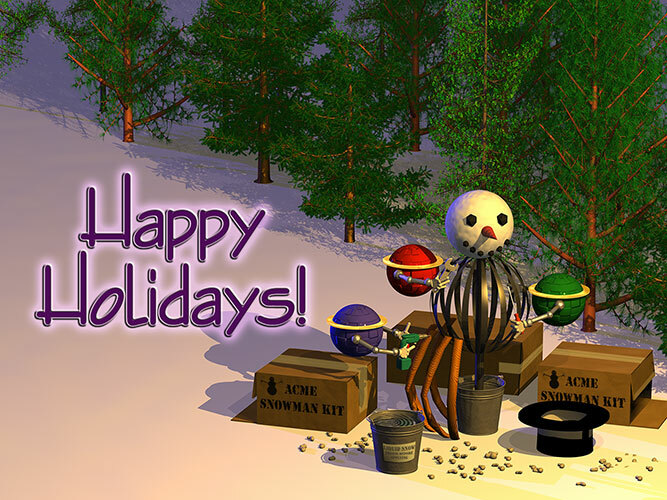 In the final image, they are with their Acme snowman kit (take that Coyote and Roadrunner! ), assembling the snowman frame – similar to the intelligent agent framework that CSI was currently building. If you look closely, you will see that the kit came with a bucket of liquid snow and the instructions on the side instruct the user that it needs to be frozen before use. Christmas 2008 rolled around and due to the success of the previous year’s card, CSI decided to take another pass at it. Momentum begun to pick up and CSI was getting noticed and asked to participate in the Office of the Secretary of Defense’s roadmap to the future for technology. I chose to use a train as the primary subject that the agents would interact with, like a train, adding momentum to our platform development and moving forward. 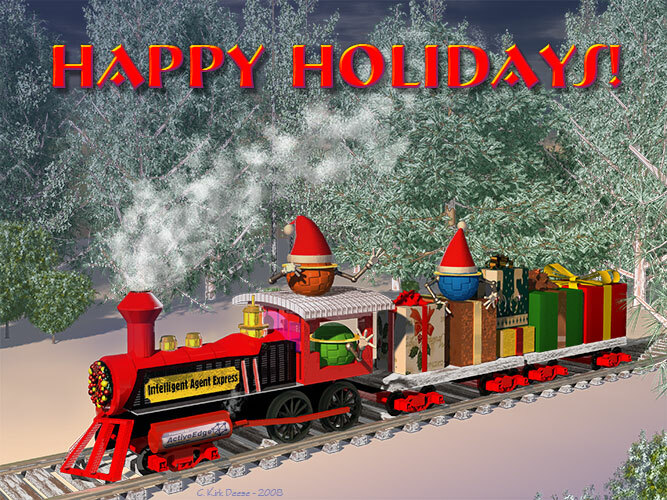 The agents were moving forward too and using that train to deliver the hits to Santa’s workshop! This was the year that agent technology began its foray into the domain of Adaptive Planning and Logistics. My thoughts were that perhaps dear, old Santa was actually running a shop with agents… to improve his efficiency! The image this year was inside the workshop, with agents taking on more tasks, managing the small repetitive items, much quicker and more accurately than an Elf, and this allowed Santa to concentrate on more important matters like delivering gifts! 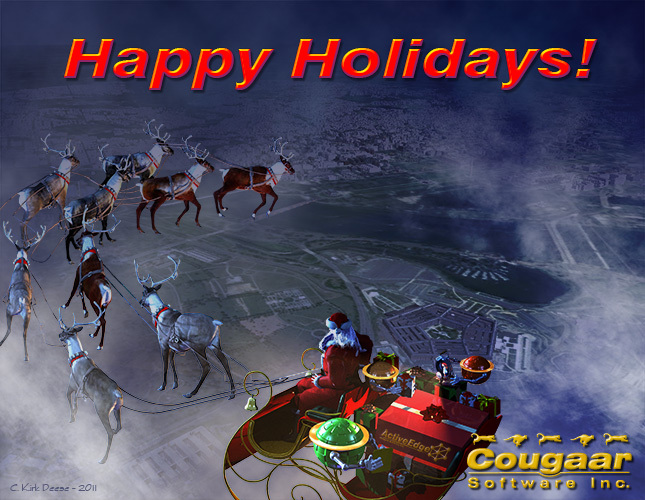 By 2010, tradition had been established with CSI agent based holiday card. Therefore, it was time once again to come up with a concept that gave some subtle hint at what was going on inside of CSI. This year several successful pieces of R&D software were created and begin to solidify the concept of building a Decision Support Tool Suite for Logistics and Planning. There were some very solid concepts that demonstrated how CSI’s agent based software could substantially improve logistics and planning in the military. For the image, I thought it would make sense to place these “gifts” under the tree. The image for 2011 is a special one as this year saw the company engage in a very large and important project for the military involving decision support tools for planning and logistics. CSI created our first incarnation of our proposed tool suite and delivered it to our good friends down at the five sided building. 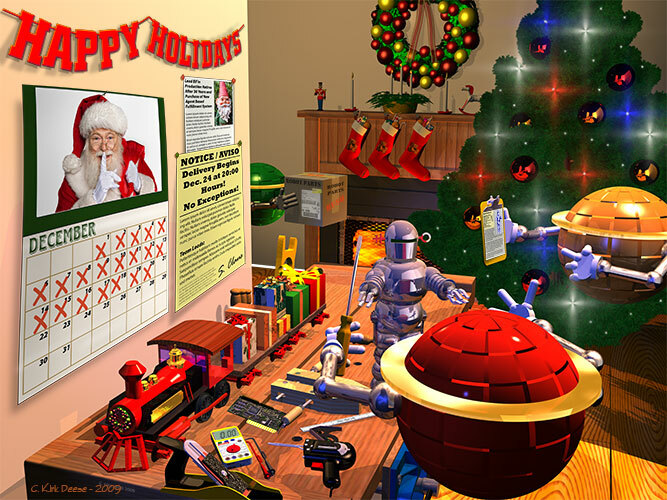 This year’s image featured Santa and the agents (sounds like a band doesn’t it) delivering the ActiveEdge® based tool suite to the Pentagon, via unconventional transportation. At this point in time, the CSI logistics and planning tool suite was gathering more interest, and our development teams were digging into what it really meant to build agent assisted planning and decision support tools. This year saw the start to putting the finishing touches on our task planner tool and began to explore the concept of a map based planning tool, sort of a traditional sand table on steroids, which explains the image for this year. Santa is using his agent based sand table to plan delivery of gifts and to pre-position gifts for pickup en-route and replenishment. In 2013, the CSI Logistics and Planning Tool Suite were developed further. Now known as MCAP (Marine Corps Adaptive Planning), CSI began to push hard into task management tools and map based planning tools incorporating the Marine Corps Planning Process. The development team was fleshing out more of the tool suite and created working demos. In effect, “packing the toolbox” like the title for this year’s card and the inspiration for the image. 2014 was a very busy year for CSI as work with the military continued, adding the Army as a seriously interested client for the planning and supply chain decision support tools. This involved an initial push into distribution in theater and how agents could improve the process. 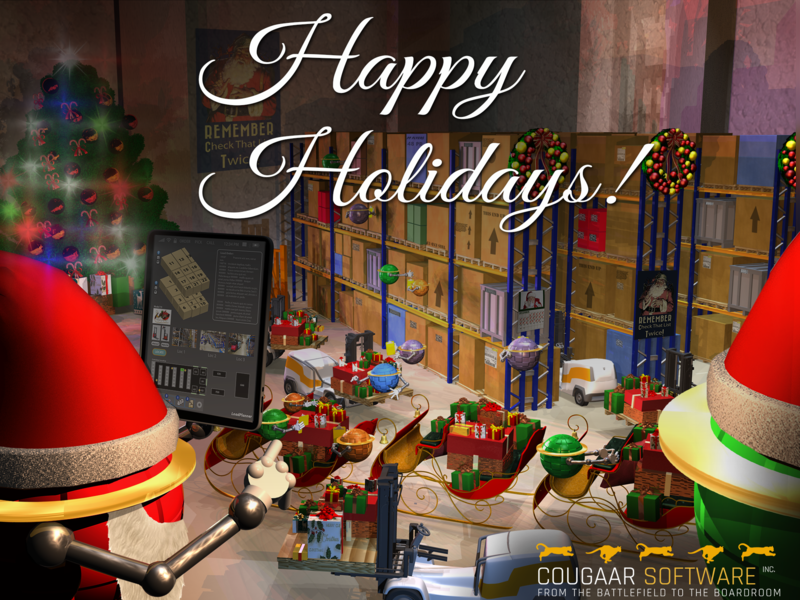 Thus, for this year’s image, Santa is back at his agent driven sand table, understanding his distribution channels through the agents, and for our clients, getting Band-Aids, beans, and bullets to the right place at the right time. The planning and logistics tool suite has matured to a point where it can be used to plan operations and track an assign tasking. The distribution components are now being fine-tuned for the agents to do optimized planning of amounts and routes as well as being able to predict what will be needed based on prior usage statistics. 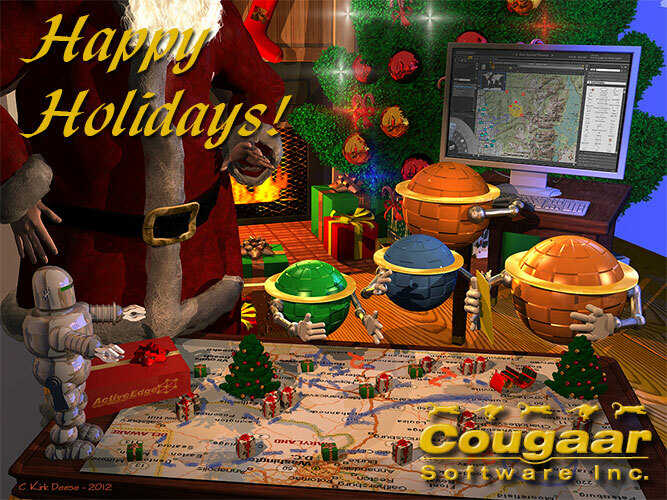 This year’s image has the agents back in Santa’s workshop optimizing the delivery route taking into account all of the logistical considerations that go into delivery of a commodity through a supply chain. The 2016 holiday card reflects the work we have been doing using data analytics to begin automating the warehouse end of the supply chain. Our previous work has always been focused on automating and streamlining the order and fulfillment side of the process. This year we have broadened our focus to encompass the warehouse component of the equation where we will implement technology to improve efficiency and automation. What the illustration is showing is an intelligent agent-driven order pull and pack system that is optimized to better service the customer.